1. Layers on Layers on Layers. Start with a basic tank or t shirt, add a sweater, add a jacket on top of that, & a winter coat on top of that. I'm wearing a long sleeve underneath this sweater & you can't even tell! Wearing a dress or skirt? Layer 2 pairs of tights. The more layers, the warmer you'll be. 2. Winter accessories. Add everything from a scarf to gloves to a hat to your outfit. The bright side to cold weather temperatures is the chance to load up on warm weather accessories that will enhance your outfit. 3. Wear warm, comfortable shoes. A knee high or OTK pair of boots will not only keep your feet warm but will also add an extra layer to your legs. I usually opt for flat boots when it's cold because of possible icy/slippery conditions. How do you look stylish while staying warm during the winter? 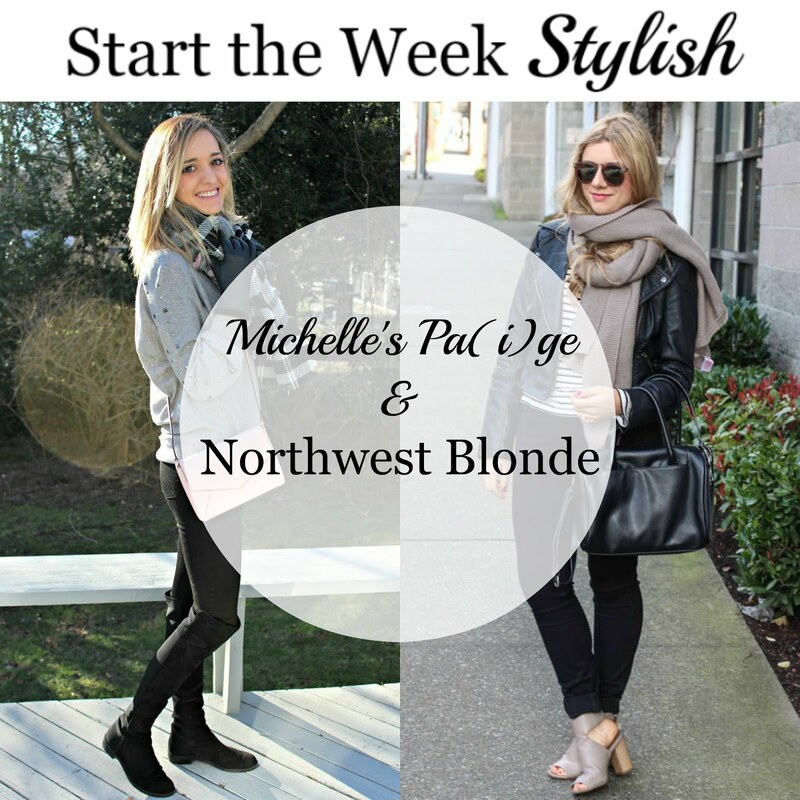 Meet our co-host for this week's Start The Week Stylish linkup: Brooke from KB Styled. 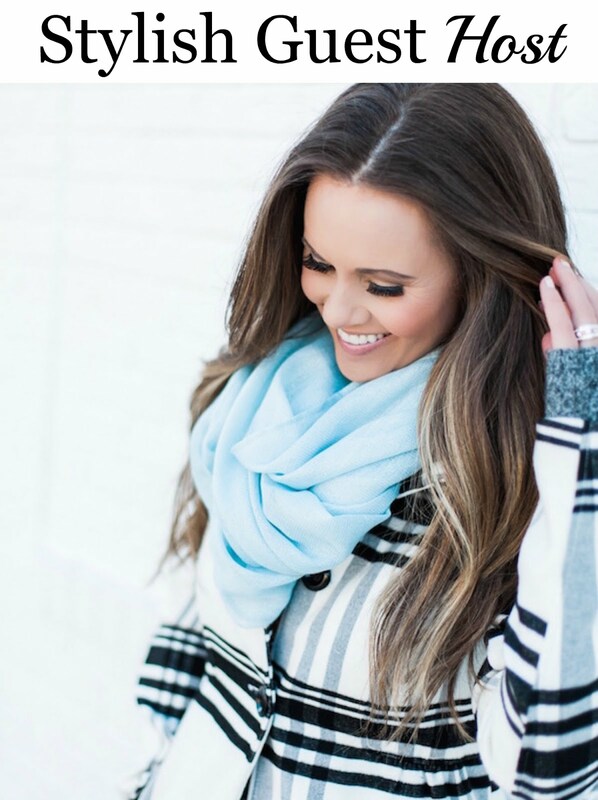 Brooke is a Nashville based fashion blogger who uses her blog to share outfits, beauty products, accessories and bargain finds! Be sure to stop by HER BLOG this week and say hello! Last week we loved Jaime from Regally Soled & Shauna from Lipgloss & Lace's outerwear looks. So chic - love how you can turn your Winter looks into stylish ensembles! Have a great week ahead! I love this look!! Your bag and scarf are so pretty! You definitely look warm and stylish!! Nailed it! Warm and stylish. Love that scarf! Love the cute crossbody with this look! Thank you for hosting and hope you are having a fab week! this is such a skill to achieve! i feel like I don't care what I look like if I'm cold...I just want to be warm, haha! I agree! Sometimes it is too much to bare, but I try to keep everything looking good even when I'm frozen! I look like a crazy bundled zombie or something on cold days hahah. It's so hard to be warm AND stylish! Love what you've done here. That plaid scarf + blush bag is such a cute combo! LOL thank you! I agree it can be tough - my biggest key is hidden layers! Tanks & tees under my sweaters save me on cold days! LOVE that scarf!! You look cozy and adorable!! Love this casual look! Warm, cozy, and fantastic!! You definitely look warm and stylish in those gloves. And nice detail on your sweater! Those crystals on the sleeves of your top are so chic and I love your OTK boots! Staying warm and stylish is def a struggle! I love your cozy outfit here and especially this bag! You always look so amazing and this look is no exception! I hope you had a fabulous Monday! I love the kate spade bag! So cute! I could not agree more. It's been a rough month of winter! Layers have been saving me too! You put together a cute winter outfit! I love your scarf and bag!